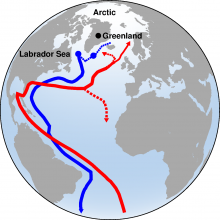 The ocean Meridional Overturning Circulation (MOC) is responsible for poleward heat transport, and deep storage of heat and carbon. Climate models generally predict that a slowdown of the MOC will occur this century, with dramatic regional and global climate changes, but how the slowdown will occur is subject to debate. It is widely recognised that convection – the downward limb of the MOC – is sensitive to freshwater fluxes, and recent investigations have suggested that the increased melt from the Greenland Ice Sheet has already reduced convection. Yet in 2015, convection returned, and was anomalously strong. Despite the expectation that the MOC is sensitive to freshwater forcing, we do not understand the processes by which freshwater inputs influence the MOC. The two key gaps in our understanding are: how freshwater reaches the regions of deep convection, and the relative importance of freshwater to convection and restratification. Numerical simulations give conflicting results on freshwater pathways, and convective parameterisations neglect small-scale restratifying processes. Traditional observational approaches cannot capture the spatial and temporal variability of these processes without inordinate cost. TERIFIC (2018-2023) addresses these gaps in understanding through new observations, leveraging recent advances in small-scale electronics to deploy large numbers of mini-drifters on the shelves of Greenland, and employing subsurface and surface autonomous platforms to characterise the balance of processes controlling convection and restratification. The analysis of these observations will answer fundamental questions about how freshwater reaches and affects the regions of deep convection, and enable a critical ground truth of numerical simulations of these processes for climate models.